D-STAR, which stands for Digital Smart Technologies for Amateur Radio, is a digital voice and data protocol designed for amateur radio. It was developed in the late 1990's by the Japan Amateur Radio League (JARL) in an effort to find new ways to bring digital technology to amateur radio. The original study was funded by Japan's Ministry of Posts and Telecommunications, and administered by the JARL. By 2004, Icom, which was involved with the development of the protocol, began releasing "D-STAR optional" transceivers, beginning with the IC-2200H. Although "D-STAR ready," these transceivers required the yet-to-be-released UT-118 add on card required for use with D-STAR. D-STAR transfers both voice and data via digital encoding over the 2 m (VHF), 70 cm (UHF), and 23 cm (1.2 GHz) amateur radio bands. There is also an interlinking radio system for creating links between systems in a local area on 10 GHz, which allows emergency communications oriented networks to continue to link in the event of internet access failure or overload. Within the D-STAR Digital Voice protocol standards (DV), voice audio is encoded as a 3600 bit/s data stream using proprietary AMBE encoding, with 1200 bit/s FEC, leaving 1200 bit/s for an additional data "path" between radios utilizing DV mode. On air bit rates for DV mode are 4800 bit/s over the 2 m, 70 cm and 23 cm bands. In addition to digital voice mode (DV), a Digital Data (DD) mode can be sent at 128 kbit/s only on the 23 cm band. A higher-rate data protocol, currently believed to be much like ATM, is used in the 10 GHz "link" radios for site-to-site links. Radios providing DV data service within the low-speed voice protocol variant typically use an RS-232 or USB connection for low speed data (1200 bit/s), while the Icom ID-1 23 cm band radio offers a standard Ethernet connection for high speed (128 kbit/s) connections, to allow easy interfacing with computer equipment. Advanced Multi-Band Excitation (AMBE) is the technology that is used in D-STAR to compress the voice for transmission. AMBE is implemented in the AMBE-2000 or AMBE-2020 chips which are found within every D-STAR radio. The AMBE-2000™ Vocoder Chip, which is manufactured by Digital Voice Systems, Inc.(DVSI), implements DVSI’s patented and award winning AMBE® Voice Compression Algorithm. The field-proven success of this technology has resulted in its recognition as the standard for voice quality in communication systems around the globe. Satellite systems such as ACeS, AMSC/TMI, ICO, Inmarsat, Iridium, Optus and Thuraya use this technology because of its superior voice quality at low bit rates. One of the biggest criticisms of D-STAR is its use of a closed-source proprietary codec, which unfortunately means that amateur radio operators do not have access to the specification or the rights to implement it on their own without buying a licensed product. This goes against amateur radio's long standing tradition of building, improving upon and experimenting with radio designs. The modern digital age equivalent of this would be designing and/or implementing codecs in software. Critics say the proprietary nature of AMBE and its availability only in hardware form (as ICs) discourages innovation, however, hams have been involved with other areas of D-STAR development, including reflectors and linking. 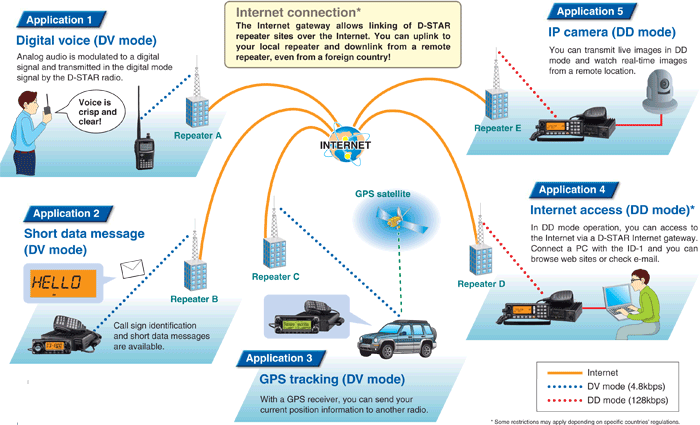 Since the early 2000's, D-STAR has developed into a robust communications system that utilyzes both radio frequency (RF) and Internet components.